Explore Australia's great Kimberley wilderness – and save! Enjoy the Kimberley highlights including pre-history Gwion Gwion and Wandjina rock art, land on remote islands and beaches, explore gorges, venture into waterways in search of saltwater crocodiles PLUS enjoy complimentary helicopter sightseeing over King George Falls OR Mitchell Falls in addition to an inclusive (and exclusive) 2 hour fixed wing Bungle Bungle Ranges flight. Fares begin from $8,190 (including savings) per person twin share for an ocean view Category B Stateroom. Darwin/Broome and v.v. including King George River and Falls, Vansittart Bay, Hunter River (for Mitchell Falls), Montgomery Reef and Raft Point, Talbot Bay/Horizontal Waterfalls, Cape Leveque, the Lacepedes – refer to specific itineraries for details. 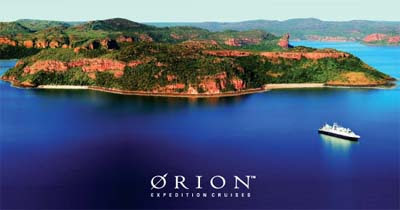 There is no better way to experience the Kimberley in 2011 than onboard Orion - the only expedition cruise ship to hold internationally-recognised EarthCheck EC3 marine tourism accreditation acknowledging world-leading sustainable and environmentally sound operating practices. Orion Expedition Cruises' environmental responsibility is recognised both domestically and internationally, including an Honorable Mention, Education, in the 4th Annual Conde Nast Traveler Save the World Awards. Orion's passion for expedition cruising invariably exceeds expectation, providing important differences no other cruise operator in the Kimberley can offer. Combine a relaxed onboard ambiance, the highest staff to guest ratio of any ship based in Australian waters, and unmatched facilities and services (including spa, hairdresser, elevator and gym) on a ship of international standards and you will discover it's not just what we do, it's the way we do it that sets the benchmark for expedition cruising in Australia and Asia.